Hi I’m wanting to try this but dont have vinegar and I’m wondering if that’s ok? You could try using lemon juice instead. Omitting the acid (vinegar or lemon juice) will make this way too salty. What brand of soy sauce do you use? I use Kikkoman, but your favorite brand will work. Aloha Shoyu is #1 soy sauce. I can’t find it here on the mainland so I order it from the company or go to ebay and Amazon. Followed this to a T, including all alt ingredients, marinading in the fridge right now! My round of guy’s can hardly wait for BBQ’d wings tonight! I’ll let ya know how it turned out but I can tell it’ll be a smash hit! I hope you all love it as much as I do. Let me know how it turns out. Chicken pieces (all of them) and leave the skin ON!!! Marinate chicken for about 4 hours. Personally, I found longer usually made it too salty for my taste. After returning to the States, some years later I subbed orange juice for lemon, and that’s wonderful, too. Cook on a HOT grill, skin side DOWN to keep the meat from scorching, about 2-3 minutes, then turn, and cook about 7-8 minutes on the other side, then go back to the skin side to finish. Toss the chicken into a baking dish and cover with foil to rest about 5-10 minutes, then enjoy! I bet you don’t have leftovers! What a blessing! I was stationed at Agana at the Naval Air Station for 1 1/2 years in the late 70’s. I became friends with several Guamanian’s and experienced the wonderful flavors of the local food. I have the chicken soaking right now! I made your red rice yesterday. Heavenly!!! Brings back a lot of great memories! Thanks for giving my recipes a try. I’m glad they bring back great memories for you. Enjoy! I also lived in Guam as a child. My father was in the Air Force. When we first moved there in 1967 housing was unavailable on base so we lived in an old warehouse that had been converted into apartments. We used to have huge BBQ parties there where they cooked in this style. I to this day love this food. This marinade is incredibly good on everything. We were also often invited to local fiestas and my mouth is watering now thinking about it and that was nearly 50 years ago. I’ll never forget my experience on Guam and the kindness of the people there. Hafa Adai! Thanks for sharing your memories of your childhood on Guam. The island has changed a lot over the years but the hospitality of the locals has not. Hopefully you can go back for a visit. If not, you at least can travel there through our local island dishes. Thanks again for stopping by. Can you put the marinade in a bag with boneless chicken breast and freeze, then thaw and cook? I had the amazing opportunity to live on Guam for a year in the late 90s. One night, while walking back to my place in Mangilao, I saw large group of people at a local pavilion eating and talking. Suddenly someone spotted me and called out to me to come over. Thinking I was being mistaken for someone else I reluctantly made my way to the group. When I arrived the lady who called me over told me to eat. I tried to explain that I didn’t know anyone there nor had I brought anything to share. The kind lady smiled, said not to worry, and handed me a plate. She then proceeded to load it up with red rice and walk me through several tables filled with colorful and divinely smelling meats and sides, describing each of them to me and encouraging me to put some of everything on my plate. When I started eating – my life changed. Foods and flavors I had never experienced, growing in the Southeastern States, soon sent my taste buds into a state of euphoria. This would be my first of many local fiestas, first of countless meals of traditional and hybrid Chamorro and Filipino foods, and the start of my lumpia addiction. As I ate with and talked to the people there that night my love for Guam was solidified. The island is beautiful, the food amazing, but best thing about Guam is the people. I made this recipe tonight for my family and some friends and it was greatly enjoyed them. For me to say I enjoyed it would be insufficient because as I ate, just briefly, I was 19 again standing under a tent in Mangilo and realizing that even though I was thousands of miles away from my hometown, I was indeed home. Rob, Si Yu’os Ma’åse’ as well for sharing a lovely memory! I hope you get to visit our beloved island again one day. Rob, Si Yu’os Ma’åse’ for sharing a lovely memory! I hope you get to visit our beloved island again one day. I had a Guamanian boyfriend back in 1982. We met at a club outside Washington DC in Maryland. His father worked for the Congressman of Guam I don’t know if I am spelling his name right. Congressman Wompat. We’ll anyway we had a dish called keliguin it was wonderful. The red rice with anichote seeds to make it red. Fried bananas all kinds of meats. It was heaven. Those are all some of my favorite foods. I hope you’re able to give some of my recipes a try. Let me know how they turn out if you do. This looks amazing! I printed the recipe to try it, thanks! Thanks, and I’m glad it turned out great in the end! Can you tell ways this is served? I have heard it is common to take meat and chop. Is that true? What do you recommend to serve that with? We normally serve this with a side of steamed white rice and a side fist (see my other recipes). As for chopping it up, whomever they led you that may have been referring to chicken kelaguen. I also have a recipe for that that you might like to try. Sounds great and I just happen to have bought a bag of drum sticks this week .I can ,t wait to make this. Great! Let me know how it turns out. I’d love your recipe for chicken kelaguen!! I haven’t had it since the early 80’s!!! I do have a recipe posted for that. Enter “chicken kelaguen” in the search box and it should pop right up, or look in the menu under Chamorro dishes or chicken. Hafa Adai, I use the same as your recipe but add Olympia beer when avail. or Busch kinds, never tried coke I’ll give it a try. Hafa Adai! Thanks for stopping by. 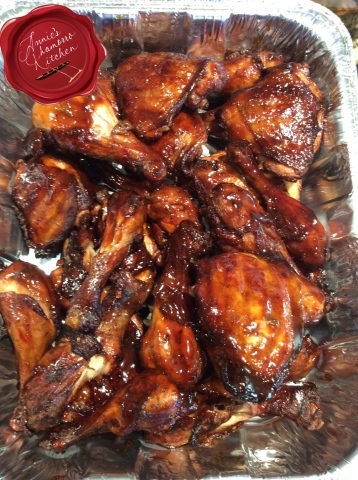 I’m happy to hear how you’re still using our Chamorro marinade. Stop by again soon and let me know about your other variations. Did u add all the optional marinade ingredients or did you pick and choose what you wanted to add. I usually pick and choose what optional ingredients I add, but adding them all is delicious too, which I do quite often. 1 cup cola, what kind? Any kind…Coke, Pepsi, your choice. I even like using Dr. Pepper sometimes. Do you add all of the optional ingredients or is it better with only certain combinations of the ingredients? Any info would be greatly appreciated! You can use any, some or all of the optional ingredients–it’s totally up to you. I like using them all. These look and sound delicious I generally bake my chicken parts at 400f for 20 minutes and they come out perfectly cooked tender and juicy. My question is , would not cooking them for 45 minutes dry them out? In my oven at 425* F it takes 50 mins for chicken (with bones) to be cooked through and it comes out very juice and tasty….but I wish I had your oven! I ran across your marinade recipe, SO DELICIOUS! I made it and it was a huge hit. Thank you so very much for sharing. My BBQ wasn’t working so I baked it at 400 degrees for 20 minutes, then cooked it stovetop in its glaze for another 5 or 8 minutes. I am hooked! Awesome! I’m glad you liked it! Thanks for sharing your alternate cooking methods too. My husband said this was the best chicken he’s ever had! I remembered my brother grilling something similar after he had lived in Guam for a year, equal parts soy and vinegar and sugar is how he did it. I liked yours with a little less sugar! So good! Thank you! I’m glad everyone liked it! Do you use a baking pan or cookie sheet to bake in oven? What temp & how long? Bake it on a rimmed sheet pan at 400 degrees for about 25 minutes, then reduce the temperature to 375 degrees and bake for another 20 minutes. You can baste the chicken with the marinade as it bakes. Check to see if the chicken is completely cooked through before eating (if still pink inside, bake them longer). This recipe is amazing. My best friend growing up was from Guam and besides Spam, rice and ketchup which is also good. When his family would BBQ You would find me at the table several times. Your recipe brought me right back to my best friends BBQ’s in the park. THANK YOU! You can cut down on the vinegar — try using more soy to make it less vinegary. How do you cook the ribs with this recipe. Low and slow on grill or baked? You can do either. I prefer it grilled, low and slow. Hi, I used your marinade recipe for my barbecue, and I have to say, it was delicious! Thank you so much! I live in the mainland and have missed island food for a very long time. Your marinade made my 4th of July special! By the way, the glaze was extra delicious! Happy 4th, and again, thanks! Mmm! White vinegar or Apple cider? Thank you for responding! They’re marinating in the frig now, can’t wait to try them! Can I cook it in pan?